SimplifyEm is a property management system that can be used by landlords and property managers to efficiently manage their properties. You can easily track income and expenses on each of your properties, charge fees, handle tenant balances, collect payments online, and communicate with tenants through tenant portals and notices. Larger landlords and property managers can streamline their time-consuming processes by automating their daily tasks. They can use the automation center to automatically account for expenses and calculate fees each month, collect payments, and send late rent notices and other statements. This can significantly reduce the manual effort needed to manage their properties each month. You can track work orders and repairs through the task center, which gives you a single place to track and update them, as well as a calendar to view what’s coming up. Tenants can send maintenance requests through their portals. Plus, you can track all communication history with vendors, owners, and tenants, and attach relevant documents to transactions, owners, tenants, and more. SimplifyEm allows you to generate a host of detailed business reports, and automatically export all transactions to QuickBooks or Excel. Banking features allow you to manage print checks, bank accounts, and reconciliations. You can track income and expenses for each property. Generate reports with details and tax reports with a single click. Stay on top of tenant information and balances. Send notices, charge fees, and collect payments online. On top of that, you can organize work orders and repairs. View a calendar of upcoming events and get notifications about maintenance requests. Manage owner balances, forward statements, send payments, and give owners a portal to view their info. Review balances for vendors, such as a gardener. Plus, you can print checks, send payments, view a balance history, and generate year-end tax reports. Other benefits are you can stay on top of bank balances, perform bank reconciliations and know exactly what funds are available. Save time by automating statements, notices, and fees. Eliminate spending time on repetitive activities. SimplifyEm’s accounting module manages accounts payable and receivable and monitors any recurring charges along with complete transaction history. The system can also generate monthly statements and export the rent records to integrated apps like Excel and QuickBooks. With SimplifyEm, property owners can get a better visibility of their occupied and vacant units. The app offers tools to collect online rent payments, create invoices, track deadlines, store lease agreements, monitor insurance, and capture tenant details. Property owners can send group emails or bulk notices for site visits, maintenance alerts, rent reminders, and any other news that needs to be shared with all tenants. SimplifyEm is suitable for property managers and landlords of apartments and single-family residential communities with up to 500 units. It is a web-based application that can be accessed from anywhere, anytime. The vendor offers free training, and support through phone and email. 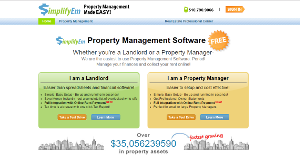 If you are considering SimplifyEm it may also be a good idea to analyze other subcategories of Best Property Management Software gathered in our base of B2B software reviews. Each enterprise is different, and can require a particular type of Property Management Software solution that will be fit for their company size, type of clients and staff and even individual niche they cater to. We advise you don't count on locating an ideal app that is going to be suitable for every company no matter what their background is. It may be a good idea to read a few SimplifyEm reviews first and even then you should pay attention to what the service is intended to do for your business and your employees. Do you require a simple and straightforward app with only elementary functions? Will you actually use the complex tools required by experts and large enterprises? Are there any particular features that are especially practical for the industry you operate in? If you ask yourself these questions it will be much easier to get a solid app that will match your budget. How Much Does SimplifyEm Cost? We realize that when you make a decision to buy Property Management Software it’s important not only to see how experts evaluate it in their reviews, but also to find out if the real people and companies that buy it are actually satisfied with the product. That’s why we’ve created our behavior-based Customer Satisfaction Algorithm™ that gathers customer reviews, comments and SimplifyEm reviews across a wide range of social media sites. The data is then presented in an easy to digest form showing how many people had positive and negative experience with SimplifyEm. With that information at hand you should be equipped to make an informed buying decision that you won’t regret. What are SimplifyEm pricing details? What integrations are available for SimplifyEm? If you need more information about SimplifyEm or you simply have a question let us know what you need and we’ll forward your request directly to the vendor.